Vivian is a junior in the Wharton School studying statistics and finance. She is deeply interested in finding out more about how things work, especially questions about economics and finance that don't have straightforward answers. Through her time as a Wharton Analytics Fellow and interning with the SEC's Quantitative Analytics Unit, she developed her passion for creatively using data as a crucial way for companies, governments, and researchers to learn about the world. In her free time, she loves dancing and listening to comedy podcasts - although usually not at the same time. Rachel Levin is a sophomore in Wharton concentrating in Finance and Statistics and pursuing a minor in Math. She is interested in how businesses across a broad spectrum of industries can harness data to drive optimal decision-making. Last summer, Rachel interned at the U.S. Securities and Exchange Commission where she used machine learning algorithms to detect insider trading. This summer, she will be working in Sales & Trading at J.P. Morgan. Outside of WUDAC, Rachel enjoys cooking and spending time with her twin sister. Catherine Bache is a sophomore in Wharton studying Business Analytics, Management, and Social Impact. She has been involved in WUDAC as an Events Committee member, a WAF analyst, and now as a WAF Co-director. She is excited to apply the skills she has learned through WUDAC as a summer operations analyst at QVC. She developed new analytical skills and gained confidence as a team member and leader. She especially loved working and learning alongside other students who are passionate about data. Besides data, she loves hugs, speaking French, and musical theatre. Andrew Castle is a Sophomore in Wharton concentrating in Statistics and Operations. He spent two years living in Jordan, and loves learning languages. He spends a lot of his free time working on sports analytics projects, and recently went to the NFL Draft Combine for the finals of the Big Data Bowl. Last summer, he used his data skills to help a large aerospace manufacturer improve their efficiency and product mix. In the future, Andrew hopes to put his data skills to work as a management consultant - or, if things work out, as the General Manager of the Boston Red Sox. Max is a sophomore in Penn Engineering and is studying systems engineering and computer science. He leads our biweekly analytics classes, and he enjoys using data analytics to solve problems. This past summer, Max worked to build models to predict Psoriatic severity to provide an early diagnoses for psoriasis. Tiffany is a current freshman in CIS and Wharton. 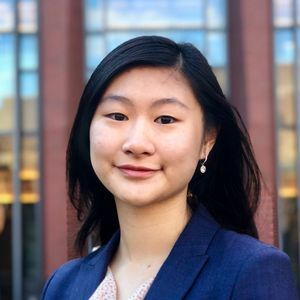 She joined WUDAC her first semester at Penn, looking to learn more about how analytics can be applied to different fields. Coming into Penn, she saw data analytics as a field in which she could use her coding skills to analyze large sets of data to find new and interesting trends. Aside from her academics, Tiffany loves to practice Latin dance on the Penn Ballroom and Latin Team. Robin is a freshman in Engineering and Wharton studying Computer Science and Finance with a minor in Math. Robin is interested in the intersection of artificial intelligence, data science, and robotics and has had extensive experience in machine learning research. Robin is also a Wharton Analytics Fellows project analyst working with Entercom/CBS Radio. Robin is interested in WUDAC because he wants to expand his skills and experience in data analytics and immerse himself in Penn’s data science community. In his free time, Robin enjoys food, poker, and history trivia. Joy is a freshman in Wharton studying Statistics and Finance with a minor in Computer Science. She is interested in using data analytics to solve problems in technology, business, and politics. Aside from WUDAC, she is also involved in Penn Community School and student Partnerships and Women in Computer Science.